[dropcap size=big]C[/dropcap]utting to the chase, The Hunger Games is unequivocally a must-see film. A believable cast brings the characters to life. Excellent production value fully realizes the story. And there’s just enough teenage drama and visceral action to satisfy lovers of both camps. The only real criticism is that there isn’t more movie to watch, because The Hunger Games is the kind of well-done film that captures the imagination of audiences and invites curiosity into all facets of the story. In the future, North America lies in ruined, separate districts controlled by a fascistic central government. Every year, the government punishes the 12 districts by forcing them to send a teenage boy and girl as “Tributes” to fight to the death in the annual Hunger Games, which is held in a special controlled arena and televised across the nation. Katniss Everdeen (Jennifer Lawrence) lives in District 12 with her sister and mother. When her sister is chosen for the Hunger Games, Katniss selflessly volunteers in her stead. Joining her from her district is fellow Tribute Peeta Mellark (Josh Hutcherson). The two are whisked away to the capitol where they are guided by their mentor, previous Hunger Games victor Haymitch Abernathy (Woody Harrelson), and trained in lethal combat as well as survival skills. Nothing they’ve learned, however, can prepare them for the sacrifices and choices they’ll have to make once they step into the arena. Fans with eclectic tastes in cinema will no doubt be reminded of the cult Japanese Battle Royale films. While the concepts are similar – high school age children forced to kill each other – The Hunger Games fully develops the concept, taking it from the realm of absurdity and landing it in the middle of a believable dystopic future. A fairer comparison would be to the Running Man with its jumbotrons, betting odds and slimy host. Nevertheless, there’s more than enough in The Hunger Games to distinguish itself. Admittedly, however, the idea of watching teens run around, hacking and piercing each other with martial weapons sounds a bit silly, but the filmmakers did a heroic job of playing things as seriously as possible, and it’s enough to convince audience to come along for the ride. This is mainly due to excellent casting and smart direction. 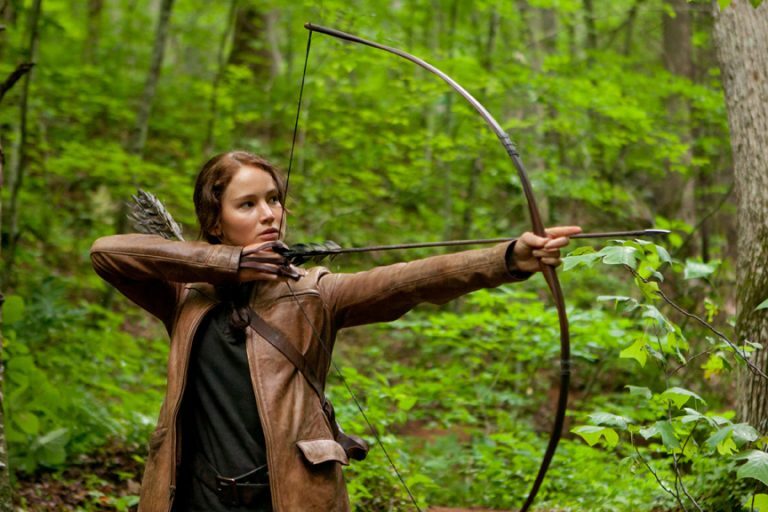 Jennifer Lawrence is fantastic as Katniss. She’s strong and feminine –unlike some of her female adversaries who seem like girls aping boys with too much testosterone. Highlighting one standout scene, Lawrence’s performance in the moments leading up to her entrance into the arena is one of the most sympathetic in any gladiatorial film. Furthermore, there’s enough for her character to do throughout the movie to challenge her emotional range in a realistic manner. Audiences will enjoy watching Katniss transform into a hardened combatant rather than a cold-blooded killer. The supporting cast is just as excellent and provide a nice pastiche of personalities for audiences to really feast their senses on, ranging from Stanley Tucci’s toothy Caesar Flickerman to Woody Harrelson’s drunk-cynic-turned-powerbroker. Completing the satisfying illusion is the wonderful world that The Hunger Games has built. Even if it doesn’t always have 100% visual fidelity, at no time will audiences ever disbelieve this universe exists. The muddy towns and villagers of the districts give way to the beautiful pavement and eccentric inhabitants of the capitol, offering a stark contrast that gets the point across without using a lead pipe. Additionally, there’s the arena, which provides its own technical wonders that’s reminiscent of The Truman Show. In the end, everything fits neatly in a tight, little package. With that in mind, it seems obvious that certain aspects were cut for time or pacing. While the film is satisfying at its current runtime, it’s wonderful to imagine the delights of even more content. Scenes hint at an important history between Katniss and Peeta as well as the loss of Katniss’s father and how that affected her and her family. There are also a handful of token scenes of political intrigue and civil unrest that would better help explain the current situation of North America than the brief and cryptic text prologue. Finally, some explanation about how the technology in the arena works would have been nice to limit the omnipotence of the game manager, and a little more character development between the Tributes would help draw more sympathy from the audience as the children die. Even without these wish list items fulfilled, however, The Hunger Games is a complete experience that will satisfy any moviegoer. A movie like The Hunger Games is a rarity. It’s violent and bloody without being gory or sadistic. Yet it also espouses heroism, loyalty and friendship. It also puts kids in dangerous situations in a believable and fair manner and manages to offer something satisfying to all ages. No lover of good movies should allow The Hunger Games to leave the theater without seeing it at least once.